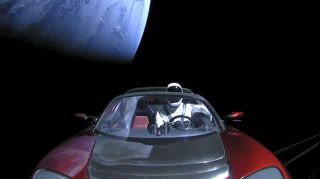 A screengrab from the SpaceX live feed shows the Roadster leaving Earth behind. There's a "midnight cherry" Tesla Roadster hurtling toward deep space right now, the first-ever payload of the Falcon Heavy rocket. It's worth asking why this is happening, and Live Science has. But given that it is happening, it's also worth asking what is going to happen to this electric sportscar condemned to what could be a billion-year elliptical journey through outer space. The first factor that will determine the Roadster's fate, of course, will be the success or failure of the spacecraft lofting it out of Earth's gravity well. If none of that happens, the next possible fate for the Roadster looks pretty similar, but happens on Mars or somewhere along the way there. As Inverse writer Yasmin Tayag reported, SpaceX has raised the possibility that the car could skim too close to Mars along its orbit and crash into the Red Planet. What if the rocket works? What if it enters its intended orbit without incident? What if an electric sportscar does end up spending a billion or so years in outer space? "I'm not so worried about the vacuum itself," said William Carroll, a chemist at Indiana University and expert in plastics and organic molecules. Human beings tend to experience some pretty grisly effects in vacuum. But that has more to do with our internal pressures no longer getting counteracted by an atmosphere, Carroll said, than any direct effects of the vacuum itself. Cars just don't have those kinds of internal pressures. "I might disable the airbag before I send it," Carroll said, "I probably wouldn't fill it with windshield washer fluid." Deal with that though, along with the pressure in tires, and there isn't much left on the convertible to go pop in a vacuum. The real forces that will tear the car apart over hundreds of millions of years in space, Carroll said, are solid objects and — most importantly — radiation. Even if the car avoids any major collisions, over very long time horizons, it's unlikely the vehicle could avoid the kind of collisions with micrometeorites that leave other space junk riddled with craters over time, Carroll said. But assuming those collisions don't completely tear the car apart, the radiation will. Down on Earth, a powerful magnetic field and the atmosphere largely protect human beings (and Tesla Roadsters) from the harsh radiation of the sun and cosmic rays. But spacefaring objects have no such protections. "All of the organics will be subjected to degradation by the various kinds of radiation that you will run into there," Carroll said. Organics, in this case, doesn't mean the bits of the car that obviously came out of animals, like its leathers and fabrics. Instead, it includes all the plastics in the sportscar and even its carbon-fiber frame. "[Those materials] are made up largely of carbon-carbon bonds and carbon-hydrogen bonds," Carroll said. The energy of stellar radiation can cause those bonds to snap. And that can cause the car to fall to bits as effectively as if it were attacked with a knife. "When you cut something with a knife, in the end, you're cutting some chemical bonds," Carroll said. A knife cuts those bonds in a straight line. But radiation will split them at random, causing organic materials from the leather seats to the rubber tires to the paints to — given a long enough time span — perhaps even the carbon fiber body to discolor, flake, and splinter away into space. And under the harsh glare of the unshielded sun, Carroll said, that process could happen fast. "Those organics, in that environment, I wouldn't give them a year," he said. Materials with fewer bonds holding them together will disintegrate first, Carroll said. Anything hidden behind an inorganic (no carbon bonds) shield would last longer, though eventually even the plastic woven into the convertible's glass windshields would discolor and come apart. The sturdy carbon-fiber parts would likely be the last to go, he said, over a much longer span of time. Richard Sachleben, a retired chemist and member of the American Chemical Society's panel of experts, largely agreed with Carroll's assessment in an email to Live Science — though he did suggest it would likely still be somewhat recognizable, at least after a million years. "A billion years is a long, LONG time," Sachleben wrote, "so no telling what it will be like by then." Carroll said that the question of whether the rocket remains recognizable also depends on who is around to recognize it. "Remember our history with tools as a race only goes back about you know two and a half million years," Carroll said, "so what someone would recognize a million years from now if they found is another story altogether." Sachleben was more optimistic, writing, "there is always the possibility that some future, space-venturing car enthusiast may decide Elon's Roadster would make a nice addition to his/her collection."